Helby's Hatch: Back and busy - new patterns! Back and busy - new patterns! Don't bother taking crafts to work on in the evening - They won't get done. But don't let them continuously buy you drinks. Being hungover and having to do customer service is not enjoyable. Once I came back home, it was time to get back to 'work' (after many hours of sleep). I worked on a few more squares in my quilt. If I keep my intended schedule, I might have it finished this coming weekend! and then I'll finally get working on some smaller sewing projects I have in mind. 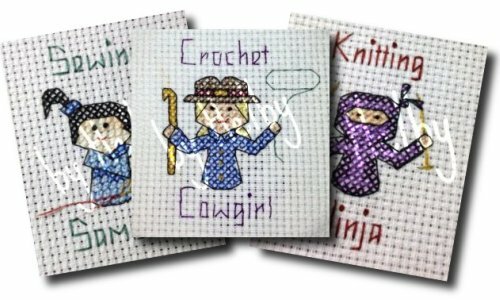 I also finally finished up these original cross-stitch patterns I've been working on. For sale now in my Etsy store! I'm your newest follower. Your stitchery is excellent. I love your little ninja, to cute. I'll be visiting you often and hope you will visit my blog and maybe follow if you like. I can think of a lot of things that aren't enjoyable with a hangover. I'm following you via GFC. I host Fluster Creative Muster Party on Wednesdays and I would love it if you would come by and party with us. Hope to see you there!